With an aim toward providing a convenient gift option for fans of dinner theater and live entertainment, Murder Mystery Texas is beginning to offer gift certificates through its website. The Texas mystery dinner theater company’s gift certificates are able to be purchased within a flexible range of dates and locations. 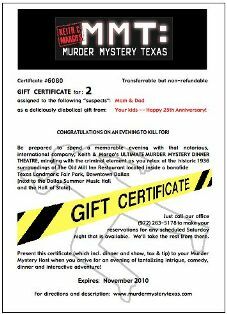 The Murder Mystery Texas gift certificate is advertised by the company as a unique gift option for enthusiasts of dinner theater and anyone who may be interested in giving the gift of a unique and memorable live entertainment experience this holiday season. The gift certificates are redeemable at selected Dallas/Fort Worth area Keith and Margo’s interactive murder mystery dinners, providing recipients of the gift certificate with a flexible range of dates and locations at which they may redeem their experience. The gift certificates are customizable in several other important ways, notes the company’s announcement. They are available to be purchased in increments of $63. The reason for the $63 increments, according to Murder Mystery Texas , is that $63 is the amount ($54 per person plus tax and tip) that it costs for one person to attend one of their murder mystery dinner performances. Thus, the price would be $126 for two people to attend a performance. Additional flexibility is provided by Murder Mystery Texas in that the gift certificates are able to emailed to a particular recipient, e-mailed to the purchaser to print out and hand-deliver or hand-delivered using postal mail. The company indicates that the gift certificates are effective for one year from the issue date and are limited to standard performances—the company frequently holds specialty or extended dinner theater performances and experiences. Within the timeframe of one year, the gift certificates are redeemable at all regular Dallas/Fort Worth locations and are able to be transferred to other parties within the timeframe. The company further provides a disclaimer that the certificates may not be used for Maggiano’s performances.